We usually don't recommend the premade Thai curry found so often in stores like Trader Joes, because a good Thai curry should start with a curry paste, then add coconut milk, fish sauce, and kaffir lime leaves as it's being prepared. 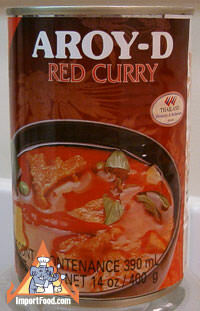 This premade Thai curry from Aroy-D is quite good if you don't have a lot of time. It's the best we've tasted, from dependable Aroy-D (makers of Thailand's best coconut milk). All you do is heat it over a stovetop, and add chicken (or your meat of choice), cook and serve with jasmine rice. Very tasty and quick. Spicy too, not overwhelming, but this has good chile heat. Ingredients: coconut milk, water, pumpkin, chile oil, red curry paste (dried red chile, garlic, lemongrass, shallot, salt, galangal, kaffir lime peel, corriander seed, cumin powder), basil leaves, sugar, red chile, salt, kaffir lime leaves. Product of Thailand.